My son's interest in Roman Numerals shows no signs in slowing down any time soon. I also already mentioned that lots of math activities based on Roman Numerals were going to appear on the blog (don't say I didn't warn you! ), so here's a quick, no prep way to practice Roman Numerals on the light table. I have certainly had to brush on my Roman Numerals with my five year old son's recent interest in the topic, but thankfully he's willing to reteach me the ones I don't remember. Or at least tell me loudly when I get a number wrong! 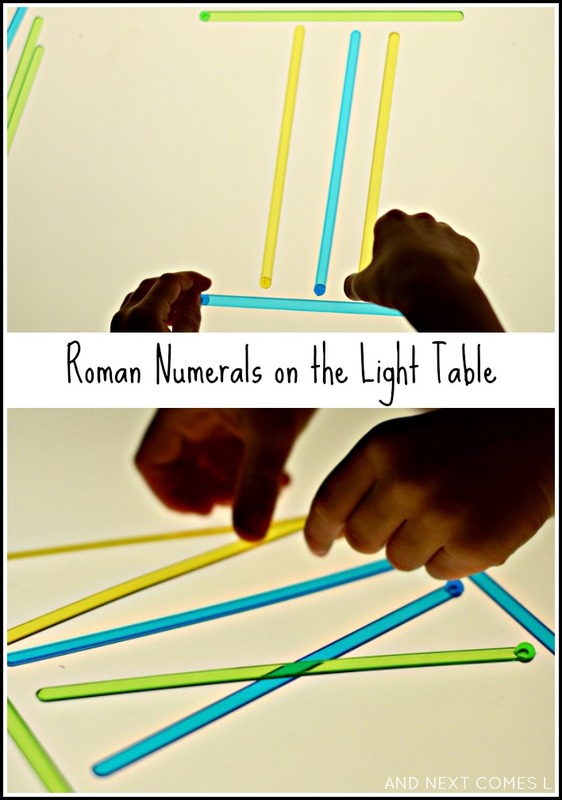 I recently set out this simple math light table invitation for him and challenged him to make specific Roman Numerals and he loved it! To make Roman Numerals on the light table, we used translucent cocktail stirrers (similar to these). As you can see, they work perfectly for making Xs, Is, Vs, and Ls. In J's typical fashion, he started with I and went up one number at a time until he got tired of the activity. I think he finally took a break around number 50 or so.